Harvest 2011 With Guest Blogger, Jessica King. 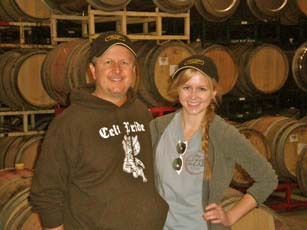 Rob & daughter Jessica at the winery. Harvest had come around again, which meant it was time for the Kings to invade the Eddy Ranch and time for me to once again commandeer their Tom Eddy Wine Blog. This year we were graced with sunshine for the weekend, which was much more pleasant than last year’s rain which seemed to indicate the coming of a second flood. Sorting Pinot Noir grapes from Manchester Ridge. Friday morning we bundled up against the 37 degree weather and headed to Cuvaison Winery to start sorting the Pinot Noir grapes for Tom Eddy Wines. These had been picked at Manchester Ridge in Mendocino at 3 am under lights, and then trucked to the winery for sorting. I had not even considered how cold the grapes would be—having been picked at nearly freezing temperatures and trucked down before the sun came up—until Jason, Tom’s assistant winemaker, kindly pointed it out to me. He turned out to be right; after 5 minutes of sorting, we could no longer feel our fingers. Luckily there were only six bins and we managed to get through them with a few hand-dunks in warm water to return the feeling to our frozen fingers. After sorting, we tasted the Saignée which had already been pumped into barrels. This is the free-run, pink juice that is quickly separated from the skins to create Tom Eddy’s rose of Cabernet, Mooton Rouge. We then inoculated some of the “wine”, though it can hardly be called that since at the pre-inoculation stage it is basically grape juice. Tom uses a specially selected yeast to help the juice ferment. We also did pumpovers, which I had never seen before. 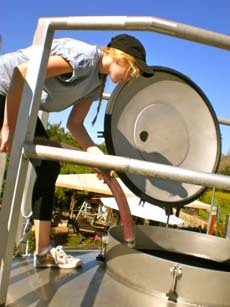 Pumpovers consist of hooking up a large hose to the bottom of the tank and pumping the juice over the ‘cap’ of skins at the top of the tank. 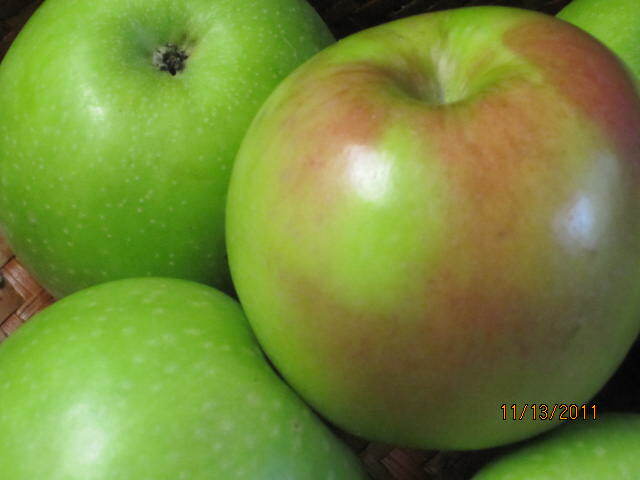 This breaks up the cap and circulates the juice to create better contact with the skins and to extract color. Without it the skins would float to the top, dry out and an insipid wine would result. Last year, we did a punchdown of the grapes and juice rather than doing pumpovers because it was Pinot Noir and too fragile to handle the rough pumpover process. With pumpovers completed, we headed back to the office for some lunch. Then it was off to Tudal Winery, a client of Tom’s, to help out Ron, the winemaker, as he sent their freshly harvested grapes through the destemmer which separates the stems from berries. We were put to work shoveling the discarded stems into a bin and stomping them. Making room for more stems from the de-stemmer. This turned out to be pretty messy work. After stem-stomping was complete, a wine and cheese break back at the Tom Eddy offices was in order. I put my dad to work helping me prepare dinner, complete with an apple crisp made from apples freshly picked from Kerry’s lovely garden. Bright and early the next morning, we headed over to Cuvaison to sample the tanks again. Nothing like a little wine to wash down breakfast. Tying down the bins so they don't fly off. I learned that all kinds of chemistry magic happens while making good wines. But chemistry is not my strong suit. Neither is math, which Jason enjoyed mocking me with while I tried to measure superfood. We then inoculated some of the barrels and Tom taught me how to tie a trucker’s knot so that I could secure the bins in the back of the truck. Next, we headed back to Tudal to taste and inoculate the tanks there. Jason played tour-guide to some people visiting the winery, and then we got to work doing pumpovers. I seriously underestimated how much that hose weighs. After we finished at Tudal, we headed back to the Eddy house for a late lunch in the garden. Then, we harvested whatever veggies were left in the garden to incorporate into a poker-night dinner. After dinner, my dad, Tom, Jason, John, and Marty commenced their poker game. Once my dad started winning I made him cash out some of the winnings to put toward my Dean & Deluca cheese fund. Near the end of the game, I brought out cake pops that my mom and I had made in San Francisco for Halloween. They were quickly obliterated and the wrappers squeezed into an empty wine bottle.